This lovely Jewelry Nantucket Basket, is the perfect little Nantucket basket for your bedside table or vanity to hold securely your precious jewelry or other small trinkets! The basic Jewelry Nantucket Basket features a lathe-turned cherry or oak wood base, tapered cane staves, fine-fine Nantucket-grade cane weaving and traditional rattan reed rims. Hardwood cherry or oak wood rims are available, and a matching cherry or oak wood swing handle attached with either bone or ivory knobs and brass washers complete this lovely Nantucket basket. Attached to the inside base of this Nantucket basket is a hand-carved bone Nantucket scallop shell! Expert craftsmanship and attention to traditional Nantucket basketry details! 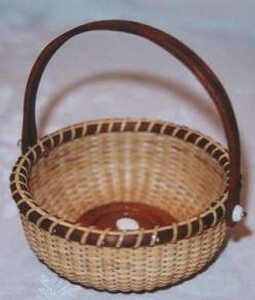 The Jewelry Nantucket Basket measures 4" diameter, 2" high and 4.5" at handle. Singed and dated on the base. This is the perfect Nantucket basket to leave your rings, jewelry and trinkets! It's can also be as a Nantucket gift basket to present a fine piece of jewelry to a loved one! Although I am no longer accepting orders for the Jewelry Nantucket Basket, I may craft one or two of these per year. When its ready for sale, you can purchase it directly from my Simply Baskets website.